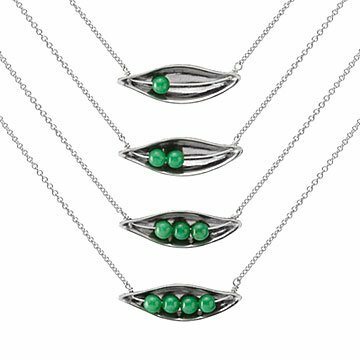 This sentimental necklace features peas in a pod to represent your children. String a symbol of your sweet peas around your neck with this handmade necklace from Britta Ambauen. Each sterling silver pod cradles up to four jade gemstone "peas" to commemorate your little ones. Whether your children or grandchildren live around the corner or across the world, you'll keep them close to your heart and add a sentimental touch to any ensemble. Gemstone "peas" are slightly mobile in their shells. Handmade in Seattle, Washington. I was so excited when I saw this necklace online. I wanted something different that was meaningful and that I can wear every day, however, I was so disappointed when I got the necklace. It's very fragile and too thin, there's no way i can wear this all of the time because it's so thin that it won't last. Very disappointing for the price! It's also too long for me and it gets in the way of my shirt collars, and it being so thin I'm afraid it's gonna get snagged and break! My wife and I have three daughters, and they all love this piece. A Christmas gift on hold.....my daughter has one child, and I am associating it was her husband, her son and she....three peas in a pod. She was an only child and I also bought things when I saw three peas in a pod thinking of her, her father and me. I wear it every day, 24/7! This is the sweetest little necklace! Well made and creative idea for a Mommy or Grandma!! This was the perfect gift. My friend's birthday was on Mother's Day this year and she had her second child. She doesn't wear a lot of jewlery so this was perfect. It is a subtle and nature-inspired mommy necklace that she loves! The one con is that it is a little short. This necklace is the perfect gift for friends with or without children! We have purchased many of the "mother" necklaces from uncommon goods, and this just like the others exceeded expectations.